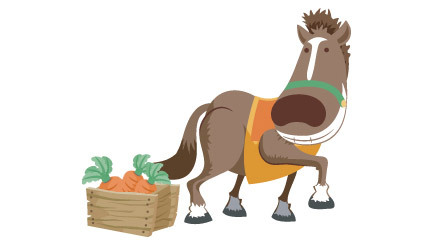 Q – My horse’s hooves are always cracking. What can I feed him to prevent this? A – Hoof health is multi-factorial; it depends on good farrier care, a healthy environment and proper nutrition. From a nutritional standpoint, deficiency symptoms are often seen in actively growing tissues, such as hooves and hair. 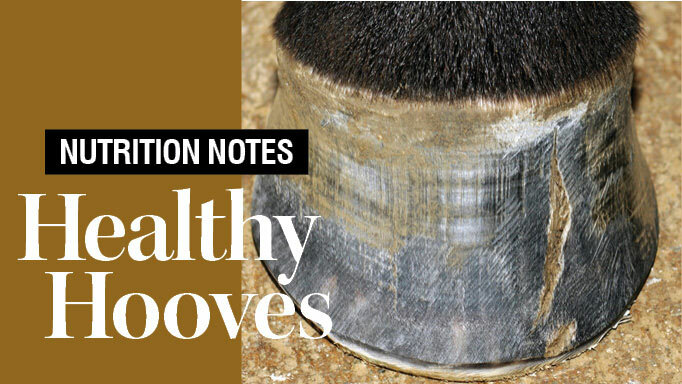 So, if your horse is truly deficient in a nutrient, you may see changes in hoof quality (along with hair coat quality), which may result in cracking. Thus, the first step in any investigation into hoof quality is to take a close look at your horse’s diet. This can be done with the help of a nutritionist, and entails weighing out all of the food your horse eats (hay, grain and supplements), looking at their nutrient composition (ideally with a laboratory analysis) and adding up all of the nutrients present. Then, you can compare these numbers to your horse’s dietary requirements. If anything is missing or deficient, you can easily find a supplement to meet those needs. 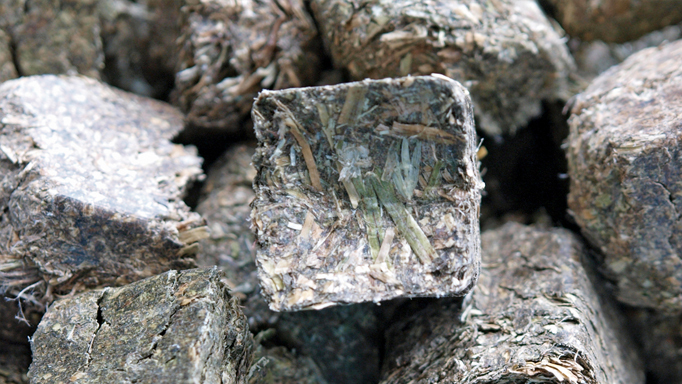 In general, however, providing a diet of good quality forage (pasture and/or hay) with a concentrate to provide additional calories (energy) as needed, and topping off any protein, vitamin and minerals lacking in the hay, will be sufficient to allow your horse’s hooves to be as healthy as possible. Sometimes, though, a horse’s hoof quality may be poor despite a perfectly balanced diet. In these cases, you may also have to look at other factors such as farrier care and/or your horse’s environment (does he spend a lot of time in a wet and muddy paddock?). In addition, some horses just appear to have weak hooves, despite the best current care, due to poor genetics and/ or health history. In some cases, supplemental nutrition (above general requirements) may improve hoof quality. Typical hoof supplements include nutrients that are found within the hoof in attempt to complement their composition, such as particular amino acids. Key amino acids (the building blocks of protein) for hoof health include methionine, cystine, threonine, phenylalanine and proline. Zinc and copper are two minerals that are essential to good hoof quality. Biotin is the most researched vitamin (or nutrient) with respect to hoof health, and it has been shown that approximately 20mg of biotin per day can improve hoof quality. It should be noted that any nutritional supplement likely can’t alter current hoof growth, and will only impact new growth. It may take several months, therefore, before any changes are observed. Another nutrition related consideration may be your horse’s body weight. An overweight horse will have additional weight to carry, and the hooves, being designed to help attempt to dissipate that weight and facilitate load bearing, might not be able to handle an additional hundred pounds (or more). Keeping track of your horse’s body condition (fat coverage) will help you adjust his energy intake so that he is kept in good weight, and should help hoof health. Ideally horses are at a “5” on the Henneke 1-9 body condition score chart (found easily online). There are certainly some things you can feed your horse that may prevent hoof cracking (namely biotin, zinc, copper and some high quality protein sources found in many hoof supplements), but the best thing to do is to look at the big picture. He should be seen regularly by the farrier, be kept in a dry (but not too dry) environment and be fed a well-balanced diet. Work closely with your nutritionist, farrier and veterinarian to ensure your horse is meeting his needs to be as healthy as he – and his hooves – can be. Why is your horse refusing the feed you offer him? 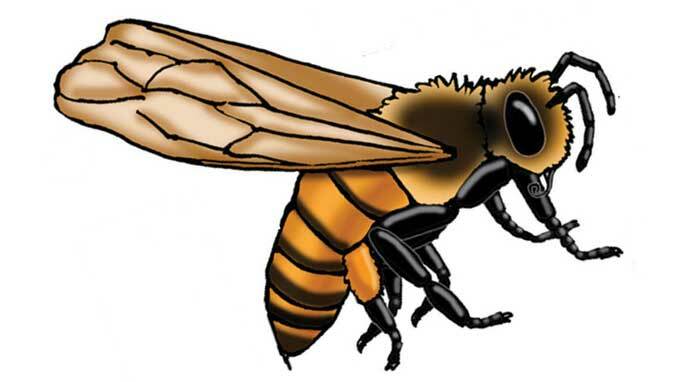 Bee Pollen - is it really beneficial for horses? 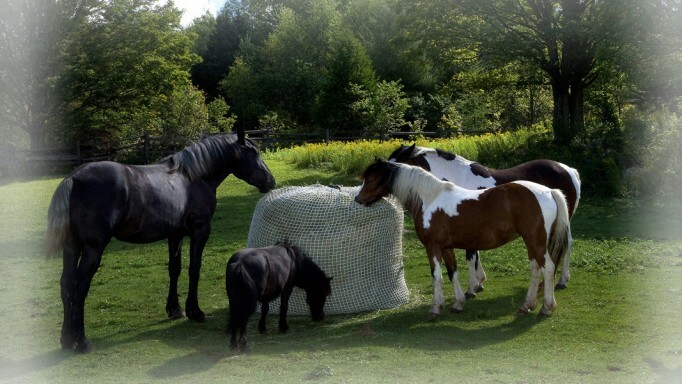 Equine nutritionist, Shannon Pratt-Phillips, PhD, gives advice on feeding hay cubes and haylage.